Arrangements from past conferences, roll over images to see larger below. 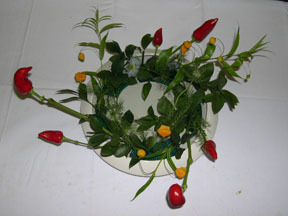 circle along the vase in a clockwise direction. Star gazers are centered, with leaves spread horizontally, both left and right. This is to be viewed from one side only. an impression of an 18th century screen painting. This arrangement portrays an autumnal scene of fields. The pampas grass is at the mercy of the wind.